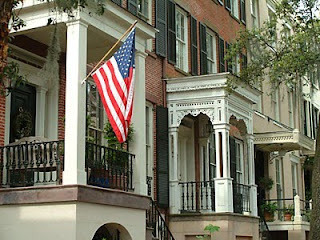 The Hostess City of Savannah is a gorgeous old Southern town filled with history, charm and intrigue. I was lucky enough to call Savannah home for a while and just adore this interesting town. The locals are friendly, quirky and happy to chat. Savannah is an ideal long weekend destination and its proximity to a sizable airport makes for easy travel. 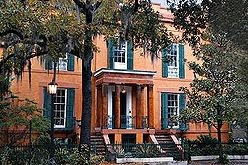 There are many wonderful hotels and B &B's in Savannah. If you are going for a visit, please feel free to email me at theconsummatehostess@gmail.com and I will be happy to make my recommendations. And now, without further adoo, my Best of the Best for Savannah. Put on your walking shoes and enjoy one of the best aspects of life in this stunning town- being able to walk nearly everywhere! 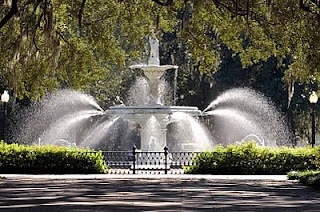 Drink in the architecture, romance of the Spanish moss, Forsyth Park, the activity on the squares and the funky SCAD students. Watch for UGA's famous mascot as he lives in Savannah and legend has it that his owner takes him for a walk in Forsyth Park every afternoon. Stop for a cocktail or beer at any one of the many pubs you will pass along the way. I love Circa 1875 and the bar at The Olde Pink House. While at The Olde Pink House be sure to indulge in the Southern Sushi and Char grilled Oyster appetizers- amazing. Spend an afternoon shopping on the fabulous Broughton Street. I highly recommend BleuBelle Boutique, it features contemporary designers such as Milly, DVF, Trina Turk and Tory Burch and the staff is just wonderful! 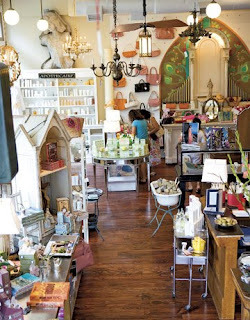 Stop by The Paris Market, See Jane and Zia Boutique while on Broughton Street to ensure a delightful afternoon of shopping. Eat lunch at Mrs. Wilkes' Boarding House on Jones Street. Don't let the line deter you, this spot has been serving up local favorites family style since after WWII and offers some of the very best food in Savannah. After you have eaten all you can stand, go for a stroll down Jones Street and enjoy one of the prettiest streets in the Southeast. 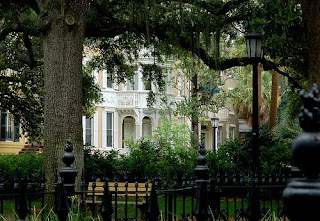 Many of the houses are 18th century townhouses and the overall effect of timeless architecture, brick streets and Spanish Moss is incredible. Check out the interesting artwork produced by the students at SCAD, the largest art school in the country. Look here for a list of current and upcoming exhibitions. 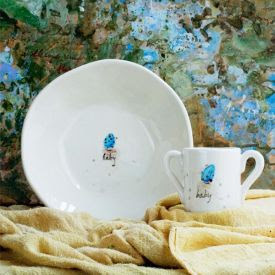 Shop SCAD is a great shop that sells only SCAD produced work and provides an opportunity to be a wonderful original piece of work. 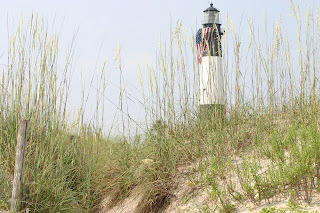 Take a road trip to Tybee Island, a.k.a. Savannah's Beach. This funky island is only ten minutes away from downtown Savannah and has nice wide beaches. Grab some fried goodness at AJ's Dockside and watch the sunset from their patio overlooking the bay. 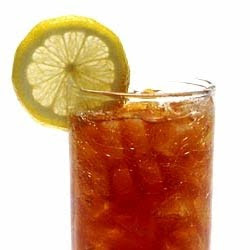 On your way out of town, eat lunch at Zunzi's and pick up the best sweet tea that you will ever have from Parker's Urban Gourmet on Drayton Street. You can read more about Zunzi's here. This entry was posted on 8:26 AM and is filed under Savannah , Savannah travel tips . You can follow any responses to this entry through the RSS 2.0 feed. You can leave a response, or trackback from your own site. This is somewhere I would just love to visit....what a really interesting post.....such beautiful houses. I miss living in the Lowcountry! Growing up we actually went to Savannah more than Charleston! Thanks for letting me walk down memory lane! Lovely! This so makes me want to visit Savannah! Everyone who goes loves it and there is obviously so many places to see while you're there. Great post! Love, love, love this post! And, obviously everything TCH related. Sending you all my best wishes today! I have been wanting to take a trip to Savannah forever! If I ever get the opportunity, I'll definitely drop you a note to get your recommendations on the best places to stay. I am sold! I would love to visit Savannah! Thank you so much for the best of the best of Savannah I have always wanted to visit. This will be so helpful when I do make it there. We haven't been there yet but it is on our list. I am trying to visit more places "locally" or somewhat local as we usually travel to Europe and farther away. We are exploring more and more of the US and Canada and there are so many amazing things to see close to home. Thanks for the tour, now I must go there!! Thanks for the post, I love Savannah! I stayed at Mansion on Forsyth, and ate at their restaurant, the last time I was there and it was amazing. I can't wait to go back. I just love visiting Savannah and I can't wait to go back. Thanks for stopping by my page. Oh sweet Savannah! It is on my list for when I eventually get to the States. But there are so many amazing places to see (sigh). I love Savannah...you hit on all the best places! The Pink House is the Best!!! Oh, how I'd love to visit Savannah!